Made of heavy 26 oz. brown water repellent treated canvas. This bag features an Armadillo Hyde security top flap, locking strap, bottom cuff and side trim. Bottom is a durable one-piece molded polyethylene. Ideal for the safe and secure handling of mail, securities, print-outs, computer tapes and disks, valuable products, jewelry, coins, currency, punch cards, bills of lading, inter-company correspondence, manifests, etc. This transparent security bag is great for transporting mail, computer tapes, print-outs and other important business communications. The transparent sides shows everything inside, so there is never any questions as to what the bag's contents. Fast growing in popularity, the transparent bag is widely used by financial institutions in an effort to prevent robbery attempts. Made of 20-gauge heavy duty transparent vinyl body, with Armadillo Hyde security top flap and bottom cuff, the bag is designed so it can be locked if desired. It contains steel locking loops and steel tipped locking strap, as well as a strong comfortable, durable leather like steel cored handle. The bottom is of long lasting one-piece molded crosslinked polyethylene. Available in two convenient sizes. Designed for use by Banks, Churches, Restaurants, Department Stores, Theaters, Clubs, Schools, Shops and Armored Cars for carrying cash receipts, tapes, print-outs, data processing materials, etc. Also great for a convenient overnight or athletic equipment bag, as well as for carrying tools and parts used by electricians, masons and maintenance staff. All materials are selected for their strong and durable qualities. Body material is a heavy duty 23 oz. water repellent canvas. The trim and bottom are cowhide leather, with matching leather handles and leather straps. The bag has a steel frame with a leather covering and convenient padlock hasp for extra security. A rugged bag with the strong and durable qualities as our canvas bag, but with an added security of a built in lock. We've taken a durable, smooth sliding metal zipper and incorporated a built-in key operated 6-tumbler lock mechanism to offer extra security and protection. The lock has a swivel top design which permits easy access to the zipper in the unlocked position. This unique locking bag is ideal for transporting confidential items such as payroll information and medical records. This deluxe locking bag has twin sturdy vinyl carrying handles, and Armadillo Hyde trim and bottom. Bag body is a heavy 26 oz. 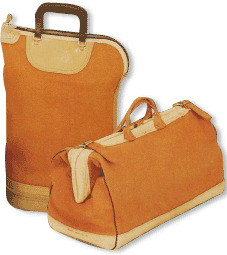 brown water repellent treated canvas, and bottom is a one-piece molded crosslinked polyethylene. The locking zipper arrangement adds maximum security to this bag. The lock is riveted to a heavy leather patch, making it a permanent part of the bag. This attractive looking bag is available in a convenient size to suit your needs and will provide years of protective service. DRAWSTRING CLOSURE THAT FITS THROUGH #3 SPUR GROMMETS POSITIONED ON THE TOP HEM OF THE MAIL BAGS. DRAWSTRING LOCKS IN PLACE BY USING EITHER A METAL OR PLASTIC ROPE LOCK. RIGHT ENTRY WINDOWS ARE AVAILABLE ON ALL BAGS. 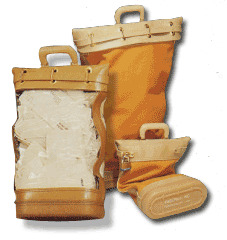 UNIQUE FEATURES: STRAP FEEDS THROUGH REINFORCED D-RINGS TO SECURE FLAP CLOSED. PLATED TUBULAR STEEL FRAME, ADJUSTABLE HOOKS WITH RUBBER WASHERS PROVIDED FOR HANGING BAGS.